Can this box be salvaged? 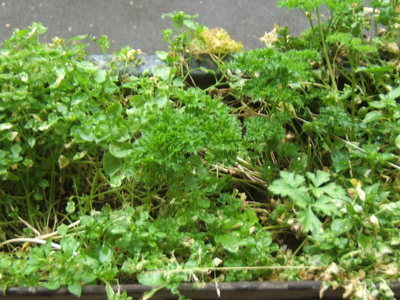 I have a windowsill box that I have noticed is growing both parsley and mint, amongst lots and lots of weeds! Can these plants be saved just by trying to pick out all the weeds or do I need to take extra steps if I want to save the herbs? Roots of mint can be very invasive, your parsley may be struggling with that. Personally I would be inclined to put the mint in a tub on it's own. I would say scrap the lot after using as much as you can and then replant, mint should be on its on in a pot or if in the garden in a bottomless bucket. Parsley plants are easy and cheap to aquire and would be unlikely to transplant anyway. I think I agree with Wyeboy - you can also freeze most leafy herbs. Take a normal ice-tray and fill with chopped herbs - a mix if you like but I like to use just one type per ice-cube. Then put (filtered ideally) water over the herbs (be carefull as they might overspill) and put into the freezer. When you want some herbs just throw one into your cooking and hey-presto! If you dont have room for a lot of ice-trays then remove the herb cubes to a freezer bag wash the tray and resume making cold drinks!